Writing a new future takes a little time—and a lot of love. Jennifer Scott made her adult fiction debut with The Sister Season. She also writes young adult fiction as Jennifer Brown, including Hate List, which was selected as an ALA Best Book for Young Adults, a VOYA "Perfect Ten," and a School Library Journal Best Book of the Year. She has written three other YA novels, including Bitter End, Perfect Escape, and Thousand Words. Jennifer writes and lives in the Kansas City, Missouri area, with her husband and three children. The Accidental Book Club opens with the scene of Jean Vison, the founder of the book club, cooking a dish for the club members and struggling to make it “book club–worthy.” How does food become a bonding mechanism throughout the story? Do you think this attention to food detracts from the ultimate experience of the book club? A complicated character, Jean is, among many things, a widow. As the story progresses, we learn of Jean’s different ways for dealing with her grief. What are they? Do you think some of them are more productive than others? Have you used similar coping mechanisms in your own life? Bailey, Jean’s granddaughter, arrives at Jean’s bearing a lot of attitude. And yet through the story she undergoes an interesting transformation. How does she change as the story progresses? What are the most important things she learns? What do you see for her in the future? As a mother, Jean Vison is surprised, perplexed, and dismayed when her daughter is diagnosed as an alcoholic. In some ways she feels responsible. Do you think mothers can and/or should be held accountable for the actions of their children—either young or adult? And how does this connect to the book Blame that Jean reads for the book club? The other members of the book club—Loretta, Dorothy, Mitzi, Janet, and May—all have different struggles and issues they are trying to resolve concerning men, children, and bosses. Which member did you relate to the most? The least? Why? Books play many roles in this story—sometimes they are touchstones to which the individuals turn for solace, sometimes they are publicly praised but have questionable ideas, sometimes they are used for wish fulfillment and escapism, and sometimes they contain new ideas that challenge the characters to act differently. What books have made significant impressions on you? Which are your favorites and what do they give you? Discuss the different kinds of romantic love depicted in this book. Do Jean, Loretta, and May all see love similarly? How does this affect the choices they make and the books they read? When Bailey has the idea of inviting a famous author to the book club, she gets him there by dangling her family’s dirty laundry in front of him and telling him he can use it in his next book. The author takes the bait—which leads one to ask: Is it fair of authors to use the material from the lives of their friends and family in works of fiction? Standing up for yourself and taking responsibility for your life are two significant themes in the book. How do the various characters accomplish this? Think of Bailey and her revelation in the hospital. Of Janet and her confrontation with her boss. Of Jean and the way her relationships change with her children and granddaughter throughout the book. Above, in the “Conversation with Jennifer Scott,” the author states “that theme of reaching out in love and connecting with the humans around you, no matter how different you are, is a theme found in all of my books, because I think learning that is the most important, and most difficult, of all life’s assignments.” Where do you see this within the book? What connections grow between the different characters and how do things change in their lives as a result? 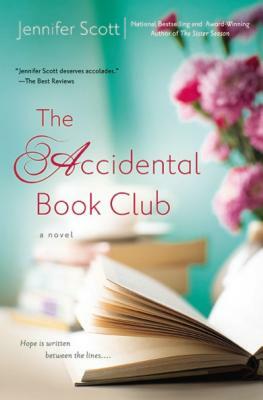 What did you most enjoy about The Accidental Book Club? What will you recall from it six months from now?